The Biltmore Forest School, established near Asheville in 1898, was the first school for the scientific study of forestry in the United States. The history of the school began when George Washington Vanderbilt, who had been plagued with a lingering case of pneumonia, traveled to a popular health spa in Asheville. While basking in the fresh air and sunshine of the North Carolina mountains, young Vanderbilt, a multimillionaire via inheritance from his grandfather, Cornelius Vanderbilt, spied Mount Pisgah looming beautifully on Asheville's western horizon. That view so captivated him that he decided to purchase all the land in sight and build a European-style chateau, fully incorporating the scene. Utilizing a New York attorney to execute the purchases secretly, Vanderbilt began to buy the desired lands in May 1888 and simultaneously launched plans for constructing his chateau. Desiring an estate similar to those he had frequently seen in Europe-ancestral seats owned by landed aristocrats-he secured the services of skilled consultants, including architect Richard Morris Hunt and America's most renowned landscape architect, Frederick Law Olmsted, creator of New York City's Central Park. When Vanderbilt took Olmsted to the site of his chateau and explained what he desired, the landscape architect quickly informed him that the woodlands in view were so miserable that it would be extremely difficult to transform them into a European-style park. Olmsted instead recommended that European forestry methods be applied. When Vanderbilt agreed to the concept, Olmsted implemented two moves that were to have monumental significance. First, he personally began managed forestry on the estate by ordering the planting of white pine seedlings and a series of selective cuttings to improve the existing woodlands. More important, he suggested that Vanderbilt hire a professional forester, leading to the hiring of a brilliant young American of French descent, Gifford Pinchot, fresh from forestry school in Europe. Pinchot considered himself the first American to undertake a professional career in forestry and was determined, as he said, "to break new ground." In 1892 the Biltmore lands became Pinchot's laboratory. Utilizing knowledge gained in European forestry schools and improvising with American ingenuity when faced with new challenges, he conceived and implemented the first working plans for the woodlands, thereby establishing the first scientifically managed private forestry program in America. In addition, Pinchot skillfully publicized what he was doing by preparing and exhibiting the Biltmore forestry story at the Chicago World's Fair in 1893. The resulting publicity brought so much fame to Pinchot that he asked Vanderbilt to secure another forester who could assist him. The Biltmore forests thus acquired a second young forester, Carl Alwin Schenck, who had a Ph.D. from a renowned German forestry school and ambition equal to that of Pinchot. After Pinchot was called to Washington, D.C., to found what became the U.S. Forest Service, Schenck became Vanderbilt's chief forester. As publicity conscious as Pinchot, Schenck cultivated friendships with the nation's leading forestry and conservation officials. Building on Pinchot's pioneering efforts, he was determined to make the Biltmore forests models for the rest of the nation. One unexpected result was that numerous young men interested in careers as foresters applied for the opportunity to serve as interns to Schenck. Their pleading influenced Schenck to establish what he called the Biltmore Forest School in 1898, the first formal school of forestry in America. Schenck preached "practical forestry," which emphasized profit. Without formal textbooks, he devised his own curriculum, sought prominent authorities as lecturers, and diligently exposed his students to a combination of theoretical and practical forestry. Designed as a one-year finishing school, his institution sought the enrollment of sons of influential men involved in the timber industry. His recruiting catalogs stipulated that an applicant be male, at least 20 years old, a high school graduate, and preferably experienced in practical lumbering. Eager applicants, especially from the New England region, flocked to Schenck's school, spending part of their time in the classroom and part in actual forest activities. The remote "Pink Beds" section of Vanderbilt's holdings became their popular summer working classroom. Schenck labored diligently and successfully to instill a strong esprit de corps in his students, and they proudly responded, calling themselves "Schenck's Foresteers." From 1898 to 1909 the Biltmore Forest School was conducted on the Biltmore estate. In 1909 Schenck and Vanderbilt had a disagreement over management practices, and Schenck was forced to leave the Biltmore estate. He found an alternate site for his school at Sunburst, one of Champion Paper Company's holdings. 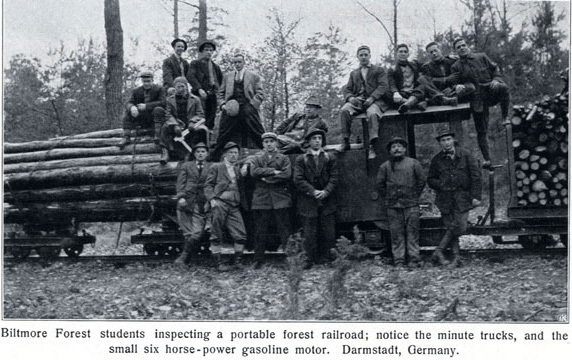 For some four years he led his students in pursuit of practical forestry, carrying them all across the nation to observe his forestry techniques at work. In the meantime numerous universities such as Yale (with financial assistance from Pinchot) and Cornell had established sound professional forestry schools and had made such inroads into Schenck's clientele that he decided in 1913 to close his school and return to Germany. Graduates of Biltmore Forest School attained prominent forestry-related positions throughout the nation and the world. Their old working field at the Pink Beds became, in 1914, part of Pisgah National Forest (the first eastern national forest). In 1968 Congress recognized the significance of Schenck's, Pinchot's, and Vanderbilt's contributions and officially established 6,540 acres of the Pisgah National Forest, centering in the Pink Beds, as the "Cradle of Forestry in America." Schenck's Biltmore Forest School was reconstructed and in 1976 designated as a National Historic Site. Carl Alwin Schenck, The Birth of Forestry in America: Biltmore Forest School, 1898-1913 (1974). Image available from the North Carolina Collection, UNC Libraries. Available from http://www.lib.unc.edu/ncc/ref/nchistory/sept2008/index.html (accessed June 13, 2012). 1 January 2006 | Jolley, Harley E.
Good luck, and thank you of thinking of a place for it!